London is often described as the greenest city in the world, as much of the capital is covered in parks, squares, commons and heaths. The more exclusive squares are closed off to the public by traditional black iron railings, accessible only by the few key-holders. When the London Parks and Gardens Trust held an Open Squares weekend, the nosey public (including Mooseys UK Team) turned out in droves! The London Parks and Gardens Trust, supported by English Heritage, staged the open weekend to promote the contribution that this historical green spaces London's environment and people. Eighty private squares opened their railings for the weekend. Eggy & I decided to visit a selection of the old or exclusive squares, as these would surely have the most impressive gardens. And because we're nosey, of course. The gardens were so absorbing that we only managed to visit six of the 120 gardens involved in the event, but hopefully these articles give you an insight into London's many garden treasures. The British Medical Association garden includes a fascinating collection of physic plants, for the development of medical knowledge. BMA House and its garden are not normally open to the public, which made it even a better treat to visit. After Covent Garden, Bloomsbury Square is the oldest square in London. The garden has circle of lime trees at the centre, shaded walks, deciduous planting around the edge and oval planting beds in each corner. 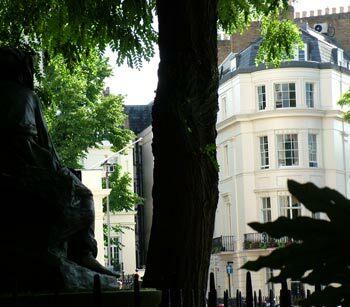 Mecklenburgh Square is a two-acre garden, registered Grade II by English Heritage. The square has mature planes, ornamental trees, formal lawns and gravel paths. Two sides of the square's borders are devoted to plants from New Zealand, some quite rare. The outer gardens of Belgravia Square is an enormous space which surrounds the inner sheltered area, and is over-looked by diplomatic buildings. Around each corner are statues and garden seats. The southern end of Mecklenburgh Square has masses of roses. The roses were putting on a great display when we visited, and so Eggy had fun with his super-close-up button.